Why aren't we building the ITER fusion reactor? We can only grow our way out of this crisis -- with more innovation and entrepreneurship, which create new businesses and better jobs. It is certainly true that with the government having borrowed $700 billion in the last month alone, more or less, the only way to pay the money back is for tax receipts to go up. If the government just raises taxes, economic growth will come to a halt and tax receipts will go down. Making us all a lot poorer may increase "fairness," but cutting tax revenue is not a sensible way to pay back all the new loans. The Times knows that economic growth will be needed to get us out of our current hole. Hillary said the same thing at the Democratic convention, but as we pointed out, she didn't seem to understand that growth can't happen unless the government gets out of the way. We've written about the space elevator which is being developed in Japan instead of here. China recently put men into orbit and India has a satellite orbiting the moon. We've become too timid, too risk-averse to continue with space exploration, but other nations are stepping up to the plate. We've mentioned innovative treatments for cancer and heart disease which are being tested overseas even though they were invented in the US; government regulations simply make it impossible to test them here. Both Bush and Paulson were visibly reluctant to be taking this step. 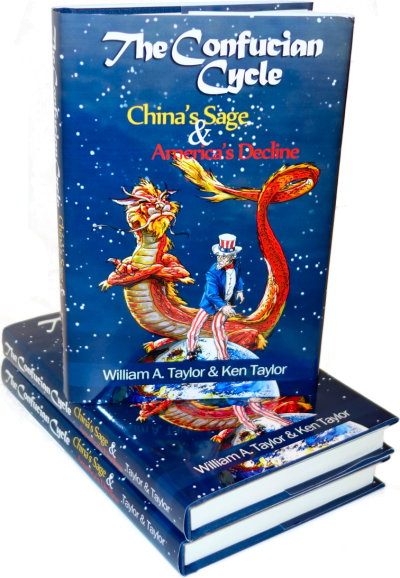 It would be easy to scoff at them and say: "What do you expect from a couple of capitalists who hate any kind of government intervention in the market?" There is a fine line between risk-taking and recklessness. Risk-taking drives innovation; recklessness drives over a cliff. In recent years, we had way too much of the latter. We are paying a huge price for that, and we need a correction. But how do we do that without becoming so risk-averse that start-ups and emerging economies can't get capital because banks with the government as a shareholder become exceedingly cautious? The article went on to point out that when the government is an influential shareholder, well-connected people will be able to get money from banks for any kind of worthless tomfoolery, whereas people without connections, that is, unknowns who want to try something new, will not be able to get money no matter how rewarding their innovation might be. We know this to be true; most of the Democrats on the relevant house and senate committees got sweetheart mortgage loans from the banks they were regulating in addition to campaign contributions from Fannie and Freddie; the rest of us were stuck paying list price for our mortgages, and nowadays would be lucky to get one at any price. We know the answer to the Times' question about how innovators are going to get money in the future - they aren't. Even before the banks were nationalized, our best innovators were finding more friendly places in which to innovate. What's worse, we can't even develop an innovation which our very own government has been funding for the past fifty years! 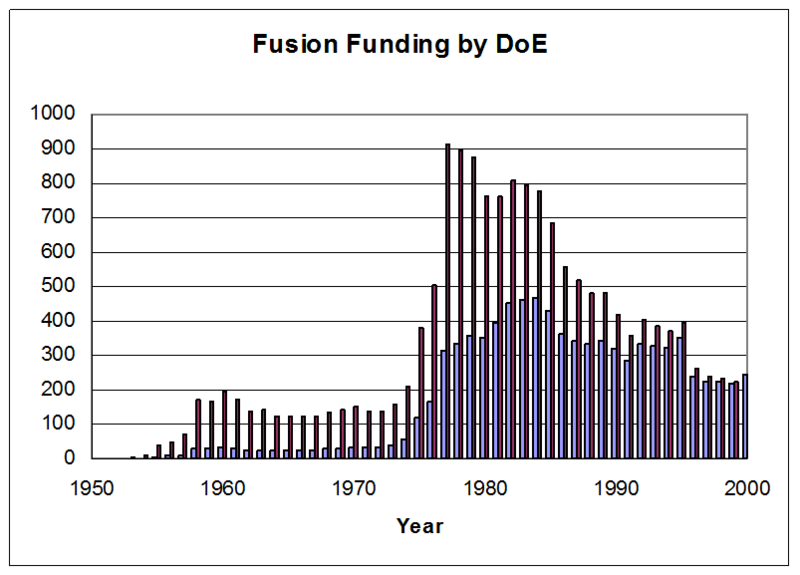 The figure shows that we taxpayers have been funding fusion research since the mid 1950's. Now that it finally seems to be paying off, where is the first commercial reactor being built? Hint: It's not in the US. The US Department of Energy generated a press release "U.S. Signs International Fusion Energy Agreement" on Nov. 21, 2006. "The energy that powers the stars is moving closer to becoming a new source of energy for the Earth through the technology represented by ITER [International Thermonuclear Experimental Reactor]," U.S. Secretary of Energy Samuel W. Bodman said. "The ITER Members represent over half of the world's population. The U.S. is proud to be part of this partnership, and to join in the pursuit of nuclear fusion as a source of clean, safe, renewable and commercially deployable energy for the future." Every country in the world is interested in the potential of fusion power. Fusion reactors are not nearly as dangerous as fission reactors and have the potential to produce pollution-free electricity by turning the hydrogen in water into helium. The hydrogen in a half-bucket of water will power all of Europe for months so fusion power won't use enough water to lower sea levels, but it will cut carbon emissions considerably. ITER will be constructed at Cadarache, France and is expected to be completed in 2015. The site is adjacent to the main research center of the French Atomic Energy Commission. The EU, as the host, will provide 45.46 percent of the construction phase funding. The U.S., as a non-host partner, will participate in the construction phase at the level of 9.09 percent. It took three years to complete the negotiations for us to be permitted to join ITER at a 10% level. Given the staggering costs involved, it's perfectly reasonable to have the first commercial reactor be a joint international project. The consortium was started in 1985 with the US as a member, but we opted out in 1999. Given that we funded the basic research for so long, why weren't we involved all the way through? It's pretty much the same reason we're not involved in the space elevator - our regulatory and legal climates won't permit it. Bridget Woodman of Greenpeace said "Pursuing nuclear fusion and the ITER project is madness. Nuclear fusion has all the problems of nuclear power, including producing nuclear waste and the risks of a nuclear accident." "Governments should not waste our money on a dangerous toy which will never deliver any useful energy," said Jan Vande Putte of Greenpeace International. "Instead, they should invest in renewable energy which is abundantly available, not in 2080 but today." French environmental groups said the project ITER, was "dangerous", "costly," and "not a job generator." A French association including about 700 anti-nuclear groups, Sortir du nucléaire (Get Out of Nuclear Energy), also claimed that ITER was a hazard because scientists did not yet know how to manipulate the high-energy deuterium and tritium hydrogen isotopes used in the fusion process. This criticism is somewhat out of date, but facts don't matter to environmentalists who want us to freeze in the dark. Given the protests the environmental movement can generate, there's good reason not to try to build the reactor here. My MIT connections tell me that the physicists there have managed to get the fusion reaction to produce more energy than it consumes and that it would be much harder to make it explode than to blow up a gas main. There will indeed be engineering issues to be handled as the project unfolds - but the action is in France, not here. The physicists are commuting to France and many of the technicians have moved to be where the action is. It's not at all surprising that the French government would welcome the ITER construction project. Decades ago, the French decided that it was not a good idea for France to be in a position to be held hostage by other governments which could decide to stop selling oil at any time. Accordingly, they pursued nuclear electricity generation and converted most of their railroads to run on electricity. It would be inconvenient if their supply of oil were cut off, but, having prepared for that eventuality, they could operate their economy. Although the Times is correct in pointing out that government involvement in our financial system will make it more difficult for entrepreneurs to get the money to try new things, the political climate of regulations and environmental ideology combined with the threat of lawsuits and of increased capital gains taxes is such that money is the least of our problems with boosting our economy through innovation. The physics people report that the French have started construction.